This is the Last Weekend for Pre-Development Pricing at Signal Hill! 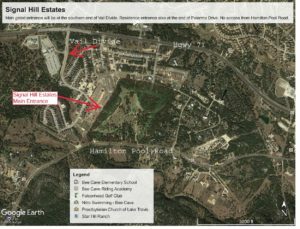 Located in the idyllic hill country of Bee Cave, Texas, Signal Hill Estates derives its name from a nearby promontory that was used by early settlers for a signaling pyre that connected communities over great distances. It’s that same spirit of connecting neighbors that lies at the heart of Signal Hills Estates—connecting to the land, and to community to create a healthy balanced lifestyle. The central focus of this connection is the authentic gathering areas at the heart of the development, the remarkable tree houses and the Community Maintained Agriculture (CMA) organic produce gardens. With minimum lot sizes of one acre, Signal Hill Estates was developed to create wide open spaces to immerse yourself in nature. We’ve built tree houses that integrate into the beautiful natural setting and inspire the imagination in the same way that Swiss Family Robinson did for us as children. Imagine a land set aside for organic produce gardens that will be managed by a professional organic gardener. Imagine a community where fresh produce is delivered to your door, where classes are taught on sustainable farming, and where neighbors spontaneously gather in a beautiful hill country setting. Imagine community picnics with food trucks, open air farmer markets, and celebrations under beautiful oak trees lit by strings of Edison bulbs and provisioned with produce picked with your family that very day. Imagine telling your neighbors you will meet them at the Bridge Tree House at 6pm with all of the kids for a sunset picnic. Imagine a life at Signal Hill Estates. While the way of outdoor life at Signal Hill Estates is spectacular, we sacrifice nothing when it comes to you stepping inside your exquisite new custom home. Each home is meticulously detailed and appointed to provide a luxury and comfort that compliments the healthy living for which Signal Hill Estates was created. Our homes offer fresh takes on timeless architecture that enhances the natural beauty of their setting. Our inspiring interior spaces are designed to connect families and guests in shared environments, while also providing more intimate spaces for you to slow down. Imagine your Pinterest page becoming a real-to-life home to be shared with those you love. Come discover Signal Hill Estates and let us help make that dream come true!